Coatings By Sandberg, Inc. is sponsoring our 5th annual contest using Dichroic Glass in an artistic or functional piece. We will be accepting photographs of your art work and placing the winning photographs on our web site for the world to see what our talented customers create with our quality Dichroic Glass Coatings. 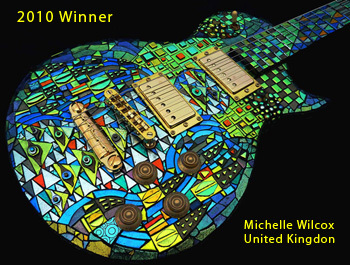 1st place winner will receive a $500 gift certificate towards CBS Dichroic glass. 2nd place winner will receive a $250 gift certificate towards CBS Dichroic glass. 3rd place winner will receive a $200 gift certificate towards CBS Dichroic glass. Categories: Blown Glass, Lampworked Glass, Fused Glass, Glass Jewelry, Glass Sculpture, Glass Marbles, Architectural, and Miscellaneous. Check out their site for the rules…I have to go run off to make something dichroic and cool to enter into the contest. Check out the first prize winner, that fab guitar in the picture!